Detailed analysis of the genetic results for the Greek population by Christos Karatzios, and Costas D. Triantaphyllidis. “HLA alleles have been determined in individuals from the Re-public of Macedonia by DNA typing and sequencing. HLA-A, -B, -DR, -DQ allele frequencies and extended haplotypes have been for the first time determined and the results compared to those of other Mediterraneans, par-ticularly with their neighbouring Greeks. Genetic distances, neighbor-join-ing dendrograms and correspondence analysis have been performed. The following conclusions have been reached: 1) Macedonians belong to the ‘‘older’’ Mediterranean substratum, like Iberians (including Basques), North Africans, Italians, French, Cretans, Jews, Lebanese, Turks (Anatolians), Ar-menians and Iranians, 2) Macedonians are not related with geographically close Greeks, who do not belong to the ‘‘older’’ Mediterranenan substratum, 3) Greeks are found to have a substantial relatedness to sub-Saharan (Ethiopian) people, which separate them from other Mediterranean groups. Both Greeks and Ethiopians share quasi-specific DRB1 alleles, such as *0305, *0307, *0411, *0413, *0416, *0417, *0420, *1110, *1112, *1304 and *1310. Genetic distances are closer between Greeks and Ethiopian/sub-Saharan groups than to any other Mediterranean group and finally Greeks cluster with Ethiopians/sub-Saharans in both neighbour joining dendrograms and correspondence analyses. The time period when these relationships might have occurred was ancient but uncertain and might be related to the displacement of Egyptian-Ethiopian people living in pharaonic Egypt. The highly polymorphic HLA system has been validated as useful for distinguishing and/or relating populations (and individuals) in many research studies since the first International HLA Anthropology Workshop (Evian, 1973) and in all the subsequent seven International Workshops. HLA gene frequencies correlate with geographically related populations. The existence or absence of gene flow among neighbouring ethnic groups may be assessed with the study of HLA frequencies and the corresponding genetic distances (1, 2)…. It also came to the unsubstantiated conclusion and made the extraordinary claim that Greeks and Japanese and San bushmen belonged in the same cluster. 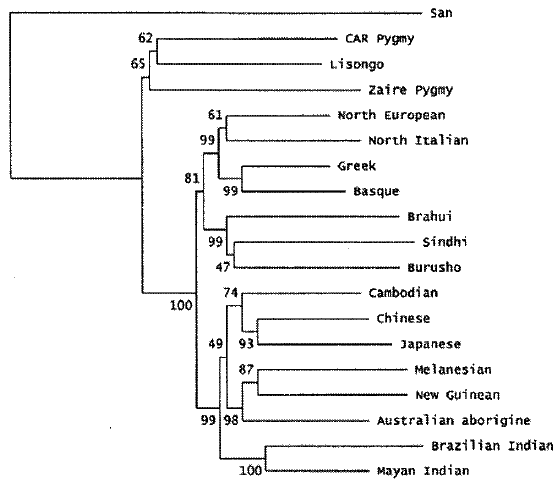 The above paper has been criticized almost universally as plain wrong, see Greek DNA and Arnaiz-Villena’s Pseudoscience and Cavalli-Sforza, Menozzi and Piazza showed that Japanese clustered with Southeast Asians (Chinese and Cambodians). Sub Saharan African mitochondrial DNA and Y chromosomes are only found at trace in Greece, and in every other study Greeks cluster with Europeans. This one gene (part of the immune system) could very easily be explained by one Ethiopian making it to Greece in classical times and natural selection taking over. High-resolution typing of HLA-DRB1 locus in the Macedonian population. Petlichkovski A, Efinska-Mladenovska O, Trajkov D, Arsov T, Strezova A, Spiroski M.
Institute of Immunobiology and Human Genetics, Faculty of Medicine, University Ss. Kiril and Metodij, Skopje, Macedonia. A multiple SNP study came to the conclusion. Ayub Q, Mansoor et al.